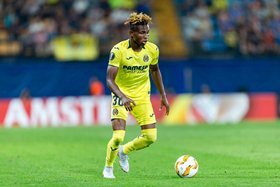 Samuel Chukwueze has really come of age after starring for Villarreal despite their 2-0 loss to European powerhouse Barcelona in a La Liga match at Camp Nou on Sunday evening. Chukwueze and his teammates gave everything but a goal in each half from Gerard Pique and Carles Alena condemned the visitors to their sixth loss of the season. The Yellow Submarine number 30 went the distance in the Spanish topflight for the fourth successive game, operating on the right wing. According to Whoscored, the one-cap Nigeria international was Villarreal's best player on the pitch with a rating of 6.91. Chukwueze was the most fouled Villarreal player, winning three fouls, the same number won by Barcelona superstar Lionel Messi. The 19-year-old also showed his inventiveness and trickery after completing a team-high five take-ons, two more than the Barcelona number 10 but three less than the top man Ousmane Dembélé. The Super Eagle attempted 2 shots of which one was on target, made one key pass and won one aerial duel.